Can I bring my kids into Foamers'? Absolutely! We have plenty of things for kids to do – board games, kid-friendly food and beverages come to mind. Children must be accompanied by a parent or guardian at all times while visiting the lounge and must be seated at the same table as their parents/guardians. Kids are welcome to stay until 9:00 p.m.
Can I bring my dog onto the patio? Unfortunately not 🙁 Because we serve food and also produce beer, we are not allowed to have any animals (unless they are service dogs) on our patio or in our establishment. Can I purchase a keg for my party? Yes, we have 50 litre kegs and 19.5 litre kegs available in the lounge for rent. For more information and flavours available, stop by for a drink and ask for our current selection. Yes, we always have a red and a white wine available. The red is currently the Jackson Triggs Cabernet Sauvignon, and the white is Naked Grape Pinot Grigio. How long will [insert beer of choice here] be available for? There is no set time for how long a beer will be on tap. There are a few factors that determine how long a beer will be on tap for. This includes, but is not limited to, how much was made, if we are filling growlers with it, and how popular the beer is (and if you like it, it’s generally safe to assume others do to…so to be safe, stock up sooner rather than later!). 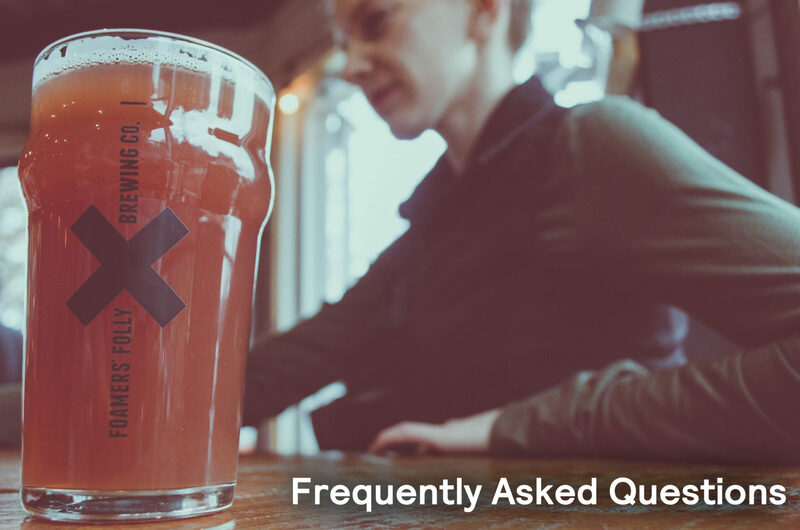 Why don't you have [insert beer of choice here] on tap? Part of our ethos is always experimenting with new creations and experiments. We never want to be sedentary and always want to push the boundaries of the beer world. Because of that, our beer board is always changing. We do have a few ‘mainstay’ beers that we keep coming back to. If there’s something you’d particularly like to see back on the menu, please drop the suggestion in our suggestion box near the door. In the meantime, the lounge staff will be more than happy to help you find another beer that you will like out of the 20 on tap. Last call is always 30 minutes before we close each night. On Friday and Saturday, last call is at 12:00 a.m., and from Sunday to Thursday, last call is at 10:30 p.m.
We currently don’t offer official scheduled tours, but if you’d like to see our setup, there’s usually someone on hand that will gladly show you around and talk your ear off. If you’d like to schedule a group tour, please contact us for more information. Yes – we do have a growler filling station 🙂 You can find out what you fill your growler with on our What’s On Tap page. Your container must be either 32 or 64 oz. but doesn’t need to be a “Foamers’ Folly” branded growler. Check out your What’s on Tap page. We keep it updated regularly.